Watercolour; signed and dated. View of farm buildings just seen in a valley, with hills rising in the background. 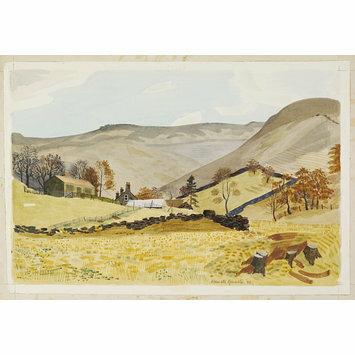 This work is from the 'Recording Britain' collection of topographical watercolours and drawings made in the early 1940s during the Second World War. In 1940 the Committee for the Employment of Artists in Wartime, part of the Ministry of Labour and National Service, launched a scheme to employ artists to record the home front in Britain, funded by a grant from the Pilgrim Trust. It ran until 1943 and some of the country's finest watercolour painters, such as John Piper, Sir William Russell Flint and Rowland Hilder, were commissioned to make paintings and drawings of buildings, scenes, and places which captured a sense of national identity. Their subjects were typically English: market towns and villages, churches and country estates, rural landscapes and industries, rivers and wild places, monuments and ruins. Northern Ireland was not covered, only four Welsh counties were included, and a separate scheme covered Scotland. 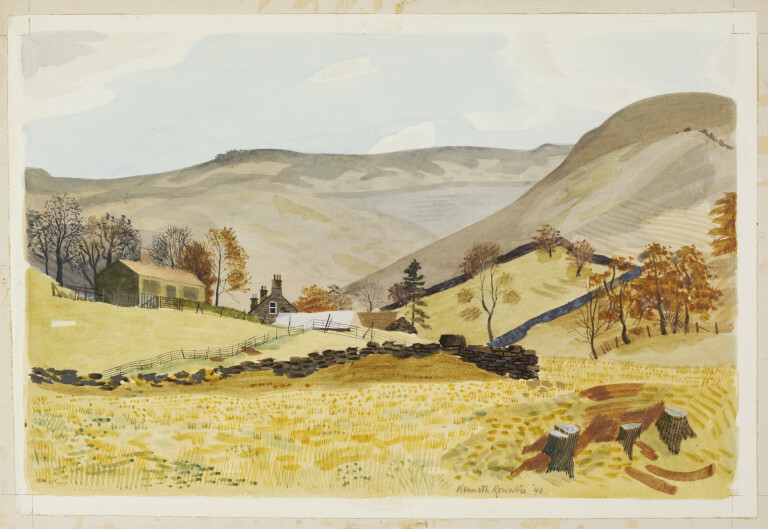 Watercolour by Kenneth Rowntree, 'Grainfoot Farm, Derwentdale', from the Recording Britain Collection (Derbyshire); signed and dated; England, 1940. Catalogue of Drawings in the 'Recording Britain' Collection given by the Pilgrim Trust to the Victoria and Albert Museum published by the Victoria and Albert Museum, Prints, Drawings and Paintings Department, 1951. Palmer, Arnold, ed. Recording Britain. London: Oxford University Press, 1946-49. Vol. 3: Lancashire and Westmoreland, Derbyshire, Cheshire and Shropshire, Staffordshire, Welsh counties, Worcestershire, Herefordshire, Oxfordshire, Gloucestershire. pp.24-25, illus. Palmer, Arnold, ed. Recording Britain. London: Oxford University Press, 1946-49. Vol. 3: Lancashire and Westmoreland, Derbyshire, Cheshire and Shropshire, Staffordshire, Welsh counties, Worcestershire, Herefordshire, Oxfordshire, Gloucestershire. Introduction to Derbyshire, p.23.